When Alfonso d’Este (1486-1534) became the Duke of Ferrara in 1505, he was as ambitious as any Renaissance prince, achieving wealth and influence through alliances with France and Spain against the Pope. 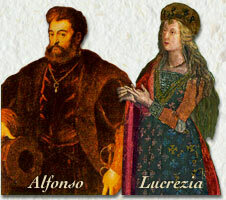 Alfonso married the controversial Lucrezia Borgia who was the daughter of the Pope and who was falsely accused of poisoning her previous husband and of incestuous relations with her father. Alfonso created at Ferrara a truly magnificent court, attracting there famous writers (Ariosto), poets (Petrarch) and painters (Bellini & Titian). For his palace at Ferrara, Alfonso commissioned art from the most gifted artists of the age, the jewel of his collection being a painting by Giovanni Bellini, the acknowledged leader of Venetian art.